Weight ranges of 95g - more weight ranges here. *All Taper Tip shafts have Constant Weight. However, the "cw" notation is NOT shown on the logo for all i95 taper tip shafts. AEROTECH STEELFIBER GIVES YOU THE BEST OF BOTH WORLDS. Steelfiber shafts by Aerotech allow you to get the best of both worlds: Get the power of graphite shafts with the stability of steel shafts. At the core of the SteelFiber shaft is filament-wound carbon fiber. The filament winding process yields a seamless and incredibly uniform bending golf shaft. The high strength-to-weight ratio of carbon fiber delivers the desired stiffness and strength properties at lighter weights than steel, and the lightweight properties of graphite increase club head speed and promote greater distance. In addition, the vibration dampening properties of graphite reduce the risk of injury and player fatigue during the round. The steel fiber material is produced using a bundle drawing process that utilizes multiple reductions in the diameter of stainless steel wire. Once the wire becomes thin enough, 1,000 individual wires are bundled together and placed inside an iron tube that is further reduced until each individual steel wire is 8 microns in diameter. Each 8 micron steel filament is approximately 1/10th the diameter of a human hair. Finally, 3,000 individual filaments are combined and spun onto spools. Comparing the hoop strength of a SteelFiber shaft versus a steel shaft under the same load is equally impressive. The SteelFiber shaft has superior hoop strength to even the steel shaft giving it better stability than the benchmark of the industry. Because the density (weight) of the steel fiber is 5x that of graphite, the shaft weight can be manipulated with 1/5th the amount of material which helps minimize wall thickness. This eliminates the ‘boardy’ feel often associated with thicker walled composite shafts promoting a more solid feel through impact. As the world’s first perimeter-weighted golf shaft, SteelFiber adds more stability and forgiveness with every shot. 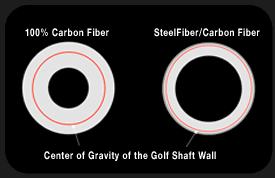 The steel fiber around the perimeter creates a greater density (weight) on the shaft’s surface that moves the shaft wall’s center of gravity (CG) outward, thus increasing the shaft’s Moment of Inertia (MOI). This shaft has really helped me lower the flight with my 3iron and its so easy to hit. I definitely have gained 3-6 yards of carry just with the switch to this graphite styled shaft. Great transaction. Outstanding communication with Carol Suh. Fine company to do business with. Can you put a bundle of tapered, 355 shafts together, 5-PW? Yes, we can! Just message us at help@grips4less.com and we'll put together a bundle set with along with a discount for you.